Away from the hustle and bustle, the Moulin du Plain is also the perfect place to meet up with family or friends and live pleasant moments in the open air. Rest and relaxation or sports activities : live at your own pace ! By the river, on a stony beach, you will enjoy the sun on a deck chair, while your children play on the slide or, feet into the water, try to skim stones or maybe you will prefer to read a book on the terrace over the river or go for a ride on one of our mountain bikes along the paths and trails down along the river and return on the Swiss side of the river. This international trail with no difficulty, can be ponctuated by a few stops by the water or in the villages of Soubey or Goumois. The area around is the right place for short or long walks with caves, viewpoints, natural sites. Maps and indications are available at the reception desk. The wide open spaces will particularly be enjoyed by children as well as your pets. Since the 60s, the French-Swiss river Doubs has an international reputation. For a long time, it was considered as “the Mecca” for fly-fishing, especially for the difficulty to catch the local wild trout “the Doubs stripped trout”, difficulty which attracts skilled fishermen. 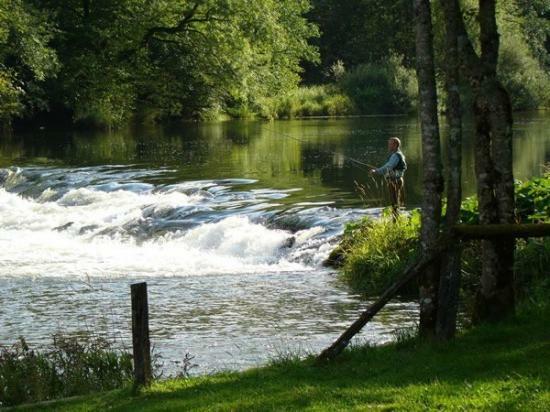 From the hotel, you have direct access to the fishing course which runs over 26 km on both sides of the river, 10 km of which are in first category and 2,5 km dedicated to fly-fishing. A place is available to store your fishing rods and waders, fishing magazines are available and fishing licences can be delivered at reception desk. For a better experience, we can put you in touch with a fishing guide who will show you the best places and teach you the specific methods to fish the Doubs.